Excellent reproduction of the carburetor dashpot assembly used on all 1968-69 340, 383, 426 Hemi, and 440 4-speed applications. The dashpot is formed from correct gauge steel, includes correct manufacturing and patent markings found on original parts, and can barely be discerned from an original. Cadmium plated jam nut included. Reference Chrysler part numbers 2933 140 and 3419 501. Used on Carter AVS carburetor numbers 4424S, 4426S, 4428S, 4611S, 4615S, 4711S, 4617S, and AFB numbers 4431S and 4620S. May also fit earlier 4-speed carburetor applications. Excellent reproductions of the Carter AVS bracket, lever, and carburetor dashpot assembly used on all 1968-69 340, 383, and 440 4-speed applications. The kit includes the formed mounting bracket, primary throttle shaft lever, two correct bracket mounting screws, and the dashpot assembly with jam nut. Parts are formed from correct gauge material and are cadmium plated like originals. 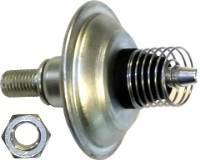 Dashpot includes correct manufacturing markings and all the details of an original part. These parts are almost always missing and actually help keep your car from stumbling when you suddenly lift the throttle! Reference Chrysler part number 2933 141 for the mounting bracket. Used on Carter AVS carburetor numbers 4424S, 4426S, 4428S, 4611S, 4615S, 4711S, and 4617S. Non Date-Coded 3/8" Fuel Filter. Looks Like Factory Original But No Date Code. Each Filter is the Correct Shade of Blue & Includes 2 Pieces of 2" KV Hose & 4 Clamps.